Ben Cutbank reviews The Politics of Reality: Essays in Feminist Theory, which Beautiful Resistance Distro has for sale in it’s catalog. 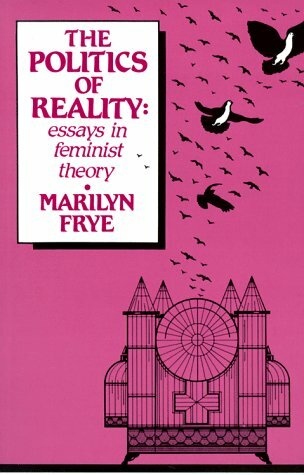 The Politics of Reality: Essays in Feminist Theory, written by Marilyn Frye in the 1980’s, is one of the most instructive books I have read to date. The succinctness of each of her essays, which cover such fundamental topics for the feminist learner as white privilege, male supremacy, lesbianism and gay rights, and violence against women, combines with an impressive comprehensiveness that leaves the reader with little room for debate. It’s simple, but forceful, similar to, I would assert, the works of radical environmental author Derrick Jensen, and especially his two-volume book, Endgame. The loving eye does not make the object of perception into something edible, does not try to assimilate it, does not reduce it to the size of the seer’s desire, fear and imagination, and hence does not have to simplify. It knows the complexity of the other as something which will forever present new things to be known. The arrogant perceiver’s perception of the other’s normalcy or defectiveness is not only dead wrong, it is coercive. It manipulates the other’s perception and judgment at the root by mislabeling the unwholesome as healthy, and what is wrong as right. One judges and chooses within a framework of values–notions as to what ‘good’ and ‘good for you’ pertain to….If one has the cultural and institutional power to make the misdefinition stick, one can turn the whole other person right around to oneself by this one simple trick. In a certain way it is true that being white-skinned means that everything I do will be wrong–at least an exercise of unwarranted privilege–and I will encounter the reasonable anger of women of color at every turn. But ‘white’ also designates a political category, a sort of political fraternity. Membership in it is not in the same sense “fated” or “natural.” It can be resisted. I see enormous social pressure on us all to act feminine or act masculine (and not both), so I am inclined to think that if we were to break the habits of culture which generate that pressure, people would not act particularly masculine or feminine. Oppression is a system of interrelated barriers and forces which reduce, immobilize and mold people who belong to a certain group, and effect their subordination to another group (individually to individuals of the other group, and as a group, to that group). The general direction of lesbian feminist politics is the dismantling of male privilege, the erasure of masculinity, and the reversal of the rule of phallic access, replacing the rule that access is permitted unless specifically forbidden with the rule that it is forbidden unless specifically permitted. It should be clear that this book is crucial reading for any person the love and courage it takes to fight for a better world. While anyone would benefit from heeding the lessons that Marilyn Frye has put forth, I especially think that men need to hear this radical feminist message and begin to join women in the fight against patriarchy and for the liberation of all of life.